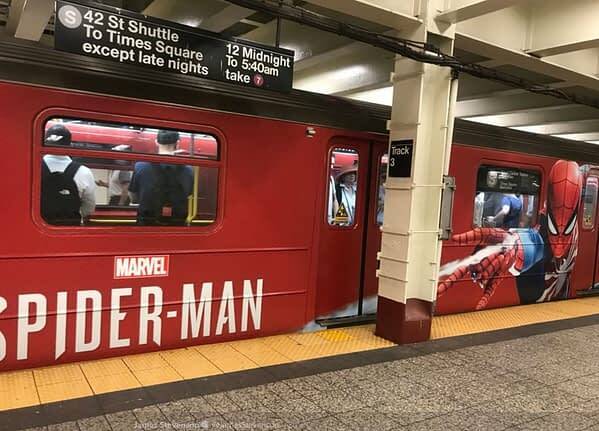 Insomniac Games’ Marvel’s Spider-Man has taken over the New York City Subway in Manhattan, covering the Times Square–Grand Central shuttle trains in red, blue, and white. Commuters on the line are pretty used to seeing take-over adverts on the S line trains as the shuttle has been used over the years to advertise everything from car insurance to tv series, so seeing adds covering every surface of the train is pretty much no big deal. It is, however, very fitting. Many Marvel heroes have called New York their home, but Peter Parker is more New York than most, as the city is nearly synonymous with the Spider-Man brand. He’s also one of the few Marvel super heroes we could imagine regularly taking the subway, in costume. So putting ads for the new Spidey game on the MTA is pretty much the most sensible marketing choice Insomniac could have made here. Today commuters in Manhattan, New York City, found themselves immersed in the atmosphere of Insomniac Games’ Marvel’s Spider-Man. Even seats are all marked with the game’s by now iconic white spider insignia that appears on the chest of the new Advanced Suit. Marvel’s Spider-Man is set to release exclusively on the PS4 on September 7th, 2018.